As you know, tonight at sundown the Jewish holiday of Chanukah begins. I love the holiday and what it stands for becuase it has so many important messages for today, which are, unfortunately, lost on so many Jews. In fact, it’s not exaggerating that the battles the brave Maccabees fought against the yokes of Hellenist Seleucid tyranny against the Jewish people–well, those battles are battles that most of the Jewish people today are willingly losing to our modern-day enemies. And it’s no coincidence that the most liberal–the most solicitous to Islamic enemies of the Jewish people–are also, in most cases, the least religious Jews, just like the Hellenist Jews who chose the Seleucid empire which mesmerized them beyond reclamation. As I noted earlier today and in years past, the most brutal–the most bloody and deadly–battles the Maccabees fought were not against the armies of Antiochus Ephiphanes. They were against their fellow Jews, the ones who chose the empty lifestyle of Antiochus’ minions instead of Judaism. The Maccabees killed many of those Jews, more Jews than the number of Seleucid soldiers. It’s also ironic that Antiochus’ people–while Greek in their Hellenist habit and custom–were geographically Syrian. Today, Syria is again home to the alphabet soup of Islamic terrorist groups–from HAMAS to Hezbollah, from Islamic Jihad to Al-Aqsa Martyrs Brigade–all of these groups are bent on the Jewish people’s destruction and then the destruction of the rest of the West. 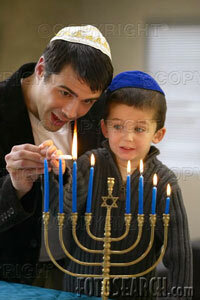 Chanukah is known as the Jewish Festival of Light. But it’s far more than that. It’s the story of miracles on so many levels, miracles Jews remember and mark during this eight-day holiday, every year. Unlike other Jewish holidays, part of our observance of this holiday is to publicize the miracles of Chanukah to the public by lighting our menorahs (plural is actually “menorot”)–the Chanukah candelabras–in our window or front door for the world to see. As a grad student at the University of Wisconsin in the early-to-mid-’90s, I became friends with a Russian Jewish immigrant, Dmitry. Dmitry, from a poor Jewish family near Siberia, was sold into slavery by a Russian businessman. As a student at a university, he was regularly beaten up by his fellow students for being Jewish. Soon, a Russian businessman promised his professors at the university that he had a great opportunity for him in the United States. To escape the anti-Semitism of Russia and expand his horizons, Dmitry eagerly agreed to the offer. But when Dmitry reached the airport in America, he was met by a Wisconsin farming family who brought him to their house, only let him shower once a week and paid him $20 a month. The family constantly asked him if he was a Jew, but he never admitted it, fearing he’d be beaten like he was in the former Soviet Union. Dmitry was used to Soviet oppression and didn’t understand that Jews, like everyone else, had rights in America. One day he escaped the farm and took a bus to Madison, Wisconsin, where he did odd jobs trying to survive. He lived across the hall from Jewish students in a dumpy apartment building. When Chanukah came, he saw their lit menorahs (menorot is the plural term in Hebrew) in their windows, and he finally realized that he could be freely and openly a Jew in America. Dmitry eventually became a U.S. citizen and with the help of the Chabad Lubavitch movement of Judaism, and the righteous Rabbi Yonah Matusof of the Chabad Madison Jewish Center, he soon became a successful businessman and always, thereafter, a proud American and Jew. It was the lights of the Chanukah menorah–proclaiming to the world that we are Jews an proud of our history, heritage, and victory over the Hellenist Seleucids–which freed Dmitry from his fears of oppression and his secret that he was a Jew. Below are some pics of some of my favorite menorahs (menorot) from my own collection, which I shared last year. It was a crappy camera, this not such great photos. But these menorot, to me, speak to the modern meaning of Chanukah. And you, too, can own two of these. 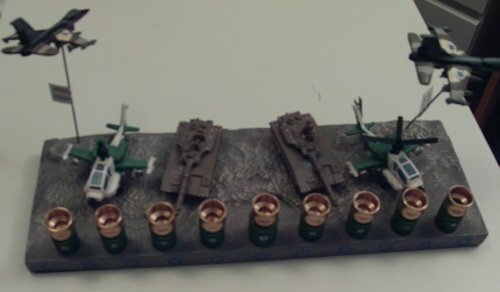 The first is a cool menorah with Israeli Defense Forces (IDF) F-16s, tanks, and helicopters. The planes, on metal rods, rotate around. 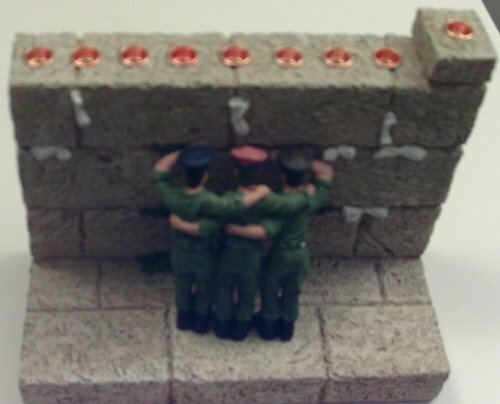 It’s called the “Israeli Army Menorah ELARMY Menorah ” and is designed by artist Reuven Masel. I especially love it because I know the sight of it pisses off all of the many Muslims who venture and lurk on this site. 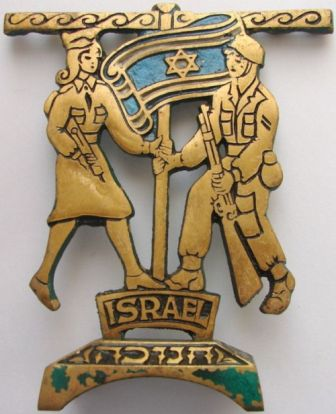 The second one is my favorite and is called “IDF Chaverim [Hebrew for “Friends”] ,” and shows Israeli soldiers praying at the Western Wall, the holiest site in Judaism. It’s designed by Uri Kaufman. 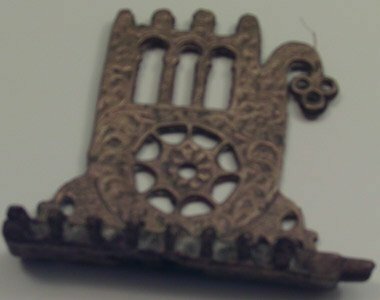 The third is an old Kurdish menorah I bought from a Kurdish Jew in the Machaneh Yehudah Market of Jerusalem. The “Hamzah” [“Five”] hand symbol is a good luck symbol in Judaism (and to Muslim Arabs–hey, they steal everything from us Jews and Christians, so why not steal that, too?). It’s not a kosher menorah because the ninth prong, the “shamash,” isn’t higher than the others, which is one of the requirements of Jewish law regarding a Chanukah menorah (more on that below). But I like it, anyway, and for me, it’s a cool decoration which I don’t use for the Chanukah lighting ceremony. As I noted, Chanukah is the story of the heroic Maccabees, led by Matthew [Matityahu, and then, after his death, Matthew’s son, Judah [Yehudah], who fought the oppression of Antiochus against the Jewish people when they were far outnumbered. But, above all, Chanukah is about the age-old, repeat fight of the Jewish people for religious freedom. It happens in every generation. That’s something we read on Passover. And something we remember on Chanukah. Today, as we Jews face a bleak future with Islamic extremism and violence on the rise, our enemies, again, are the modern day version of the Jewish Hellenists the Maccabees slaughtered: Jews who’ve forsaken Judaism for liberalism. They’re the ones who voted for Barack Obama, the ones who continue to pander and “outreach” to our avowed enemies in the Islamic community. I’ve written about so many of them on this site over the years, and their names need not be mentioned on this holiday. We know who they are. And they know who they are. Their views must be crushed, just as the Maccabees crushed Jewish Hellenism. How sad that, today, they cannot be conveniently done in by the Maccabees. How sad that there really aren’t any modern day Maccabees. I say it every year. And it never changes. There are no Matthews or Judahs. Just pollyannas. There are scant few among my fellow co-religionists willing to fight for the West’s survival, and far too many who run faster than Usain Bolt to kiss the feet of Muslim extremists in our communities in America. With very few exceptions, they would have been among the carnage necessary for the Maccabees’ miraculous victory. I’m not suggesting violence, as the Maccabees needed to engage in. But, again, the most savaged targets of the Maccabees were not the enemies without, but the enemies within–their fellow Jews, whose behavior could have meant the end of Judaism . . . and could mean its end, again, today. The Maccabees showed no mercy toward these ignoramuses who eagerly embraced the enemy, toward these eager sell-outs. No mercy. And since these modern Hellenists dominate my religion, killing it from inside with their own special brand of liberal gangrene–and since there are no Maccabees–we see the results in the shrinking number of Jews worldwide. And so I recognize and remember all of this as I light, tonight, the first of eight candles on my Chanukah menorah, marking each night of this joyous holiday. Tomorrow night, I’ll light two candles, marking the second night, and so on. 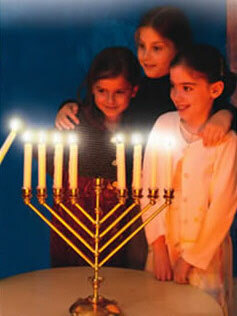 The ninth candle, the shamash, is used to light the other eight. It is required to be elevated in height from the other eight candles, which are supposed to be uniform in height on a kosher menorah. Contrary to what Hallmark and American Greetings and Best Buy (and Snuggie) would have you believe, it is not–as I’ve noted here many times–a major Jewish holiday. That’s why, unlike on important Jewish holidays, we Jews can work [on the holiday]. I only do not work while my Chanukah candles–which are required to burn for a half hour–are lit up. Chanukah has only become important, here in America, because of weak, ignorant Jewish parents who cannot explain to their kids that we don’t have a Christmas or a holiday at the same time of the year that is as important to us as Christmas is to Christians. This is largely a phenomenon of Jewish immigration to America and the dumbing down of parenting across America and all of its religions and social strata. These parents are too lazy, too inept, too ignorant themselves to teach and demonstrate to their kids the inner beauty of this great holiday. I’m lucky my parents did that, even if–one year–the bottle cap menorah I made burnt through and the whole table caught on fire. Speaking of Hallmark, I’m often asked why the name of this Jewish holiday is spelled a gazillion different ways, especially on greeting cards. That’s because of English transliteration from Hebrew. It begins with a “Ch” sound, which is similar to the noise you get from clearing your throat. It’s not an “h” sound, but most Gentiles–and now, many Jews–are unable to pronounce the “ch” sound. As for the two “n”s or two “k”s, those are irrelevant, as it’s all about transliteration and phonetics. There is no right way to spell “Chanukah” in English. But I prefer the latter spelling. The eight gifts thing–or even one Chanukah gift–is really not part of Chanukah, either. It’s also part of the incorrect “Just like Christmas” phenomenon. In Europe, traditionally people gave gold coins–called “Chanukah gelt”–and ate fried potato pancakes, called latkes. In Israel, they eat sufganiyot, jelly donuts. Jews in America tend to eat both of these on Chanukah. The bottom line is that, no matter how Chanukkah is celebrated by various Jews around the world, it is about Jews–with all odds against them–vanquishing their enemies, both their enemies without and within. On the bright side, as with all enemies of the Jewish people, with all odd against us, we defeated the Greeks and Antiochus. I’m hopeful we’ll defeat Islam eventually, too. Like I said, Chanukah is about believing in–and experiencing–miracles. To my Jewish friends and readers, I wish you a Happy Chanukah, and to my other friends and readers, I hope this explained this beautiful holiday to you. Thanks to all of you for being vigilant and helping to fight the modern-day Hellenists. (And if you haven’t been vigilant, it’s time to star.) And thanks to all of you who sent me such warm Chanukah greetings and good wishes. The name “Maccabee” is an acronym for the [Biblical] verse “Who is compared to You among the mighty, oh Lord” (Exodus 15:11). More on Chanukah from Judaism 101, Matityahu’s Revolt, and the Constantia Hebrew Congregation of Capetown, South Africa. Beautiful Debbie. I always thought that Channukah should be given more importance, not because it coincides with Xmas, but because Jews fought for freedom against the enemies of Halacha, and the enemies of the Jewish people. At Passover, we learn from the Hagadah (at least the Hagadah that we use), that the enemy from within is greater than the enemy from without. This is not only true for Jews, but for America. Today, as you so elegantly point out, we are faced with the enemies of freedom. These enemies pose in the cloak of liberalism. We face the Islamic forces within our country, who are actively looking to capitalize on weaknesses in American society, and weaknesses in our defenses. And then, we have those who seek to kill the messengers and all others who exercise their freedom of expression and thought, like the morons that send threatening, anti-Semitic hate messages through the email. Cowards all, and traitors to American values. We must continue to be vigilant against all of these enemies. We will not be silenced. There are a few modern day Jews who aspire to be something like the “Maccabees.” May there be more. Thanks Debbie for this article and the photos of the wonderful menorot. Happy Chanukah! God bless the spirit of the Maccabbees! Thank you for your tireless work of honouring Jews and especially the Brave Ones who have died in their service to G’D and protecting His People. Yes, the enemy moves about freely within and without. The evil and murderous haters of mankind who obey satan (knowingly or not) shall perish completely in the End Times. Those who stand with Israel shall have salvation. May The Lord of All Creation bless you and your loved ones and continue to give you strength and wisdom to continue. Peace be with you. Thank you Debbie and Happy Chanukah to you and all of the proud Jews out there. only fenale Judge. She was also a Heroine). Thanks for writing that, Debbie. Hanukkah marks the last time the Jews won a war and nobody griped about it being “an injustice”. 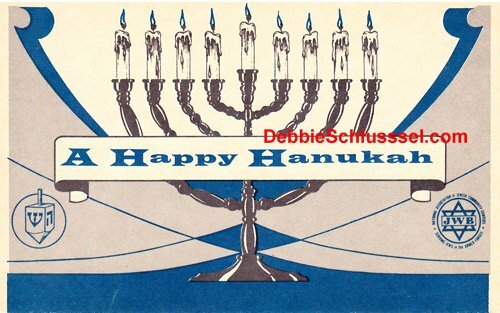 Happy Hanukkah, Debbie. Thank you so much for your work and for enlightening us Christians about your faith. We love and appreciate you very much. Happy Channukah, Debbie. I too believe that the enemy inside is more toxic than the enemy outside. Debbie, I celebrated Hanukkah tonite. I ate an oily latke but the celebratory ingestion was marred by the lack of accompanying apple sauce. I had actually considered smuggling in my own little pudding cup type pot of apple sauce just in case but I didn’t want to trigger a stampede of angry, apple sauce deprived Jews. I’m not Jewish, but wish you & the Jewish readers of you a very happy Chanukah. P.S. Why is the word spelt w/ a ‘C’ rather than an ‘H’? A deLIGHTful Chanukah to you & yours. 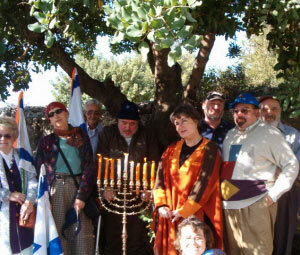 Menoros, menoirois or menorot are some of the plural forms for the singular Menorah or Menoirah, depending on your Hebrew pronunciation. 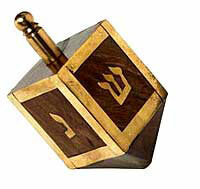 One could suspend an tiny oil jar with a handle from the thumb part of the “Chamsa” Menorah. There’s a huge difference, Debbie, between knowledgeable Jews turned monstrously evil, who purposely side with their mortal enemies against their own people in a war & the completely ignorant masses of Jews today, over 3,300 years after God gave the Torah in the presence of 3 million people. I grew up in the 60’s & 70’s in the middle of America attending a so-called “Reform” Jewish congregation until my Bar Mitzvah at age 13. At 16 I was in terrible shape but was figuratively pulled out of the depths and was fortunate to attend a Jewish school in Crown Heights in Brooklyn, NY opened by some very young Chabad (Lubavitch) men for Jewish boys with little or no Jewish background. I just want to say that what I learned there and in the Rabbinical College I attended subsequently was a vast amount. The vast majority of Jews in America seriously know almost nothing, a negligible amount about Torah true authentic actual Judaism. They, along with the 20% or so non-Jews who think they’re Jewish, are left with gefilteh fish. Judaism is beyond infinite, yet they never had the opportunity to be in a yeshiva, a Jewish school, where they would have learned that they could learn many new things daily that all come together in an inexplicable manner, showing that the Torah & Judaism are actually, palpably, obviously from God Almighty. Almost every non-Jew is completely unaware that there have been 7 basic laws of humanity that were given to the entire world, 6 to Adam, the 7th to Noah. They’re called the 7 Commandments of Noah, or the Sheva mitzvois b’nei Noiach. There are several Chrisian congregations in America who have left Chrisianity to practice the 7 basic laws, which are actually over 80 plus all laws of the land agreed to by mankind, like marriage contracts between men & women, traffic lights, etc. According to Judaism, the Jewish people were tasked with lighting up the world by explaining that there is one God who communicated that observing these basic laws merits one everlasting life. And that any good a non-Jew does is rewarded greatly in the next world, which eventually will be an everlasting life in a body that will be a physically different kind of body, as the verse intimates, “And all flesh will see that the mouth of God spoke.” This means that our flesh will have the ability to “see” in the world that will exist after the coming of Moshiach, the messiah, & after the revival of the dead (yes, Jews gave the idea of resurrection to the world, at least as we were told it exists by God & not just a man-made idea). Yadda, yadda, yadda. Happy holidays to all and happy new Gregorian year. 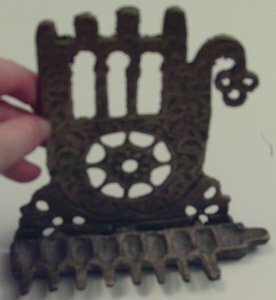 About suspending the oil jar from the “Hamsa” menorah… I meant to say that if it had a wick & was lit it could serve as the shamash so it would be a kosher menorah. I meant that the 7 commandments are called the 7 commandments of the CHILDREN of Noah. Beautiful, Happy Chanukah! As a christian who has been volunteering in a Jewish independent living complex in Southfield, I have learned so much about the Jewish religion. So much so, that I told my husband the more I learn, the more I believe we are doing it wrong. .. What is the reason for the two different spellings? Chanukah and Hanukkah? While I like your keen eye and sharp wit regarding events in the mid-east, I do not share your desire to eliminate the liberal wing of our people. The bible has been and is the most influential book for social reformation. I do not want to go back to a any less enlightened time in the past. I wish us progress, to go forward and improve the world through education and tolerance. BTW-The acronym for Maccabi is from Miriam’s song. “Mi camocha baelim adonai”, is properly translated as “Who is like you amongst the gods, my lord?” Evidently, the prophet Miriam was not a monotheist. Does this fact shake your desire to have the Jews only be of one mind? It should. There are at least two explanations for Maccabi: one is based on the Hebrew word for hammer…i.e. smashing army. The other is for Mi Camocha… and of course to suggest that Moses’ sister Miriam was anything but a monotheist is blasphemous, heretical, offensive, and a sign of ignorance. Throughout the Torah mention is made of “serving other gods”, the point being that there ARE NO OTHER GODS other than the One… “They worship vanity and nothingness”, “they worship idols of silver and gold. They have mouths that cannot speak, eyes that cannot see, ears that cannot hear… whoever worships them should become like them”. I.e. the folly of worshiping that which isn’t real and doesn’t exist except as man-made icons. Miriam was singing about the fact the for all the Egyptian “gods”, none of those fake non-existant entities could save Egypt from the one true God. And of course, God wants us to be of one mind, so that’s all that really matters to Torah observant Jews. Which doesn’t make it acceptable to shun or be mean in any way towards our ignorant/lesser educated brothers and sisters. Show them the truth and let them learn. Think “What would Moses do?” or “Did Abraham behave that way?”. Happy Channukah, Debbie. Thank you for sharing your personal treasures with us in photographs. I can’t begin to tell you how much I have learned since I started reading your blog.